This Instant Pot Ramen is delicious, with tender chicken, gooey ramen eggs and vegetables in a hearty chicken soup. Spice up the ramen noodles with chili oil for an extra kick. This is comfort food in a jiffy and takes only 15 mins in the pressure cooker. How to Make Instant Pot Ramen? Do you know that you can make ramen in an Instant Pot and it takes only 15 minutes in the pressure cooker? Yes! 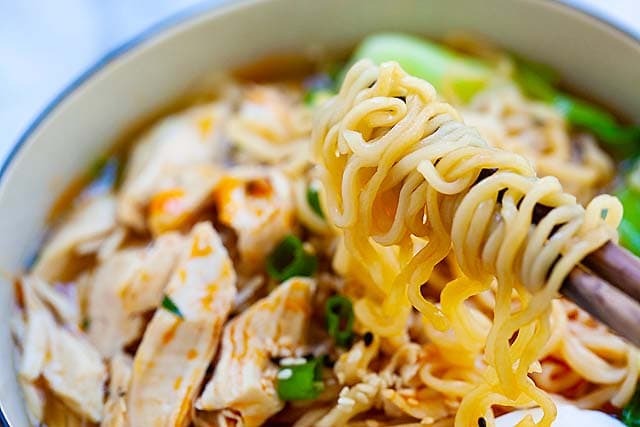 This mouthwatering ramen is cooked in the Pot with chicken and the results are absolutely mouthwatering. This Instant Pot chicken ramen is a two-step process. First of all, you pressure cook the chicken and the broth. Next, you cook the ramen and vegetables using the Saute mode. It’s that simple. Many people make the ramen eggs by using the trivet before making the soup. For me, I chose to make the eggs using the stove top when the chicken broth was in the pot. It’s faster and save a lot of time! To make proper eggs with soft, gooey egg yolk just like Japanese restaurants, you can try my Japanese ramen eggs recipe. Depending on your preference, you can either choose pork or chicken for the soup. Green leafy vegetables such as bok choy. Discard the seasoning packets inside the ramen packages. You only want the dry ramen blocks. Instant Pot ramen noodles are not meant to have leftovers; you want to finish the ramen and the soup as soon as they are done cooking. The noodles will become soggy and soak up the soup if left inside the pot. You may add mushrooms, carrots or use another leafy green vegetable such as spinach for this ramen recipe. The chili oil or La-Yu turn this recipe into Spicy Instant Pot ramen. Yummy! How Many Calories is Instant Pot Ramen? This recipe serves 4 people, with 542 calories per serving. 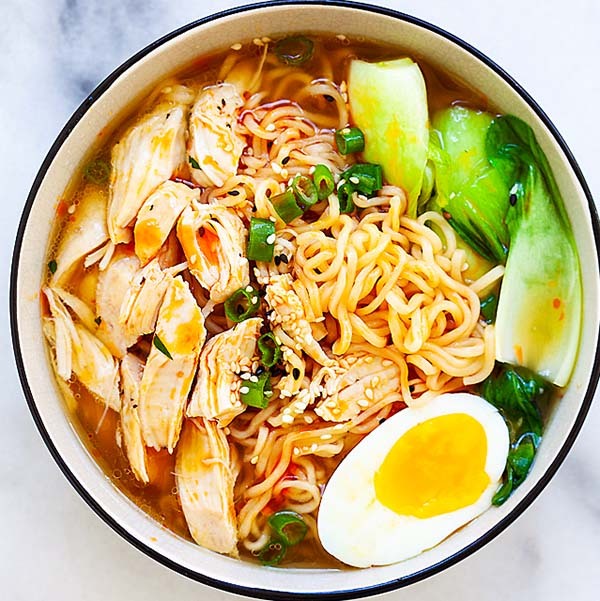 This Instant Pot Ramen is delicious, with chicken, eggs and vegetables in a hearty chicken soup. Spice up the ramen noodles with hot oil for an extra kick. 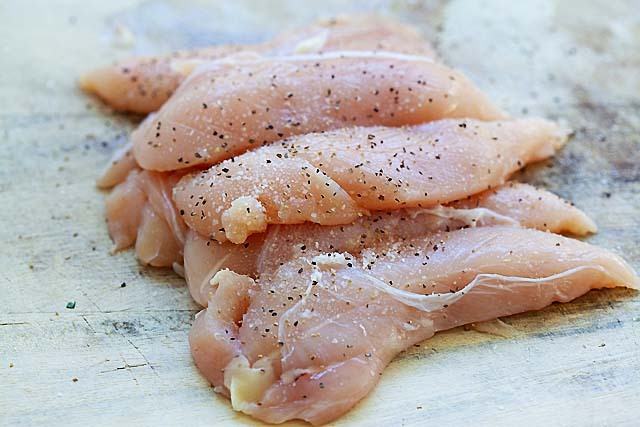 Season the chicken with salt and ground black pepper on both sides of the chicken. Turn on the Saute mode on the Instant Pot. As soon as the pot is fully heated and hot, add the oil. 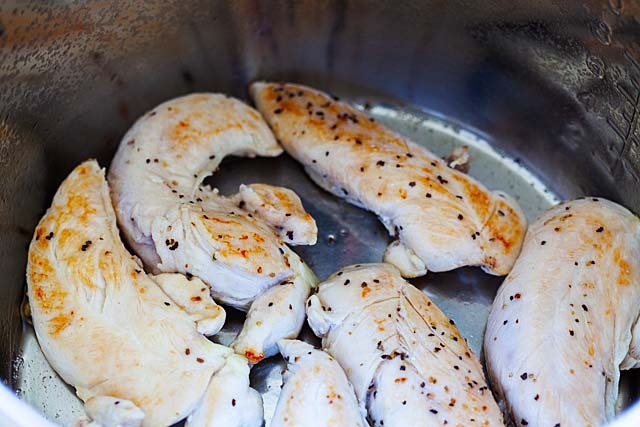 Pan sear the chicken until both sides turn brown. Add the chicken broth, water, and the white parts of the scallions. Cover the pot and select Manual and set to High pressure for 10 minutes. Meanwhile, make the ramen eggs. In a small pot, add cold water. The water level must be deep enough to cover all eggs. When the water boils, add the eggs and cook for 7 minutes. When your eggs are done cooking, plunge them into ice water and leave to sit for 5 minutes. Carefully peel off the shells, while the eggs are still in the water. Make sure you remove the membrane covering the egg white. Slice the eggs into halves. Set aside. When the Instant Pot beeps, turn to Quick Release. When the valve drops, remove the lid carefully. Discard the white parts of the scallions and scoop out the chicken. Let cool and shred the chicken using two forks. Turn to Saute mode and as soon as the soup boils, add the chicken and ramen noodles. Make sure you push the ramen noodles down so they submerge in the soup. As soon as the ramen noodles becomes soft (no longer in a block), add the bok choy and soy sauce. Stir the ramen around. Cancel Saute mode and remove the pot. DO NOT OVERCOOK the ramen as the noodles will continue to cook even after you remove the pot. Divide the ramen noodles into four bowls. Top with ramen eggs, chopped scallions, sesame seeds (if using), and dashes of chili oil. Serve the ramen immediately, do not keep in the pot as they will turn soggy. To make eggs, please follow my Ramen Eggs recipe here. If you don't have an Instant Pot, you can make this ramen noodle soup on a stove pot. Just use a regular pot to make the recipe. For the seasoning, please use Japanese Bonito-Flavored Soup Base such as Mizkan, if you have it. If not, use light soy sauce. Hi Gwen thanks for loving this Instant Pot ramen recipe. I love ramen noodles, too. Can this be made with rice noodles? Thanks for trying the Instant Pot ramen.